Posted January 30, 2013. George Eyser, olympic gold medalist in the parallel bars and vault, had a wooden leg. He lost his real leg after he was run over by a train. 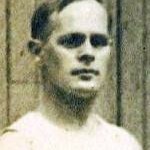 He won 6 olympic medals in one day in 1904. You got me George!